I had a really nice birthday; I took the day off from work and went to Disney Springs (which will always be Downtown Disney to me, LOL) with Melissa, Ally, and their brother, Denis. When I went back to work the next day, my lovely co-workers had decorated my desk and thoughtfully put a walker in front of it, LOL. I didn't do much reading or blogging in June, which has pretty much been the norm for 2017 so far. 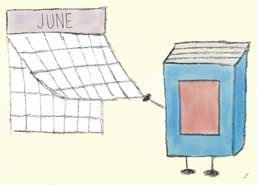 I see the start of July as a clean slate, though, and I'm really going to try to set aside dedicated reading and blogging time. I hope everyone has an awesome July and a fantastic second half of 2017! A walker lol. Sound like fun co- workers. :) Seriously though happy birthday!! And yes Disney Springs should always be Downtown Disney! !